The increase in popularity of Farmers Markets has been rapid over the past ten years. In the early 1990s there were only a very few Farmers Markets, with those being seen as either an affected yuppie type activity or a place for vegan lefties to hang out. This is thankfully no longer the case! Many UK towns and cities now have a monthly if not weekly Farmers Market, wit more and more people attending every event to see what all the fuss is about. So what is all the fuss about? Well, Farmers Markets are a wonderful way to utilise local produce, support your local farmers and suppliers and not buy everything from a supermarket. It is a great opportunity to vote with your feet too - in 2007, one in every eight pounds spent in the UK was at a Tesco supermarket - so buying from a Farmers Market is a step in the right direction of balancing out where our hard earned money ends up. When Farmers Markets first started cropping up, there were criticisms that they were over priced, with suppliers cashing in on the upmarket reputation rather than offering a credible, affordable alternative to some supermarket counters. As their popularity has risen and the farmers and producers are seeing more and more customers on a regular basis, they are able to be far more competitive. This is perhaps because going to a Farmers Market used to be seen as a very middle class Sunday activity, rather than a way to buy good quality, affordable, local produce, whereas many people now see the Farmers Market as an integral part of their weekly or monthly shop. So not only are Farmers Markets more affordable, they are also responsible. At most Farmers Markets you will find producers and suppliers of meat, poultry, fresh fish, jams, chutneys, fruit and vegetables and often items such as marinated olives and speciality cheeses. These suppliers may have desperately wanted to supply to the likes of Tesco a few years ago, but with an ever growing list of demands and price cuts and the increase in popularity of the markets, these people are finding that they are able to maintain a higher level of control over their businesses, livelihoods and production methods. These producers and suppliers are usually more than happy to talk to customers about their products - were they source their ingredients from, how their animals are looked after, what transportation is used and the background behind their recipes. Not only will you gain excellent information about what you are eating, but also you often get some really good deals. The stalls are often keen to not take much stock back home with them, so you will find they throw in something extra or offer you a good price, especially later on in the afternoon. 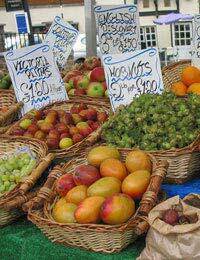 The responsible aspect of using Farmers Markets also greatly reduces the food miles your purchases will have travelled. In a supermarket the English asparagus is likely to be sat right next to the Peruvian asparagus - if you look at the labels you will see the countries of origin and, of course, you can chose accordingly, but at a Farmers Market you will only see local produce. There are Farmers Market guidelines for the locality of producers, so invariably you will only see stall from a relatively small local radius. This means that the fruit, vegetables and meat you buy here will be locally reared, grown or produced too. You will also be giving your money straight to the farmer or producer, rather than their little cut coming out of the supermarket coffers.